Remember a few months ago when we were all waiting for the Apple keynote to see whether Apple would indeed introduce an iPad 3 or last year when we expected an iPhone 5? What happened? Many of us were disappointed to find out those products never happened despite all the rumours that were circulating. The revolution we wanted never happened that many wanted but something quite strange has been happened in the smartphone industry in the last few weeks. There have been people speculating and awaiting what's coming in a new smartphone and for once it's not an Apple product. Samsung have succeeded in keeping everyone on their toes with what the Samsung Galaxy SIII will be when it is finally announced. Samsung have given an indication today that we need only wait a few more weeks as they will most likely make the announcement on May 3rd. Samsung looks to have settled on a roll-out strategy similar to Apple's where they announce one big product every year and to their credit that they've managed to get people this excited. Samsung has become the de facto standard of what Android is and in the battle with Apple internationally, it has firmly set its sights of what Google Android / Samsung can do to gain mainstream acceptance within the Middle East. 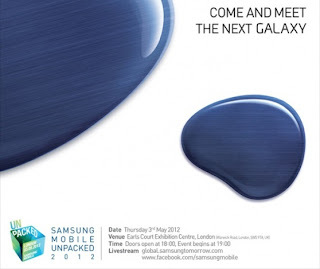 Let's hope Samsung doesn't disappoint us with the Galaxy SIII announcement (if it is indeed called that) like Apple has done because you get a sense that many consumers aren't going to be quite as tolerant as they have been with Apple thus far.